Mt. Fuji was designated as a World Heritage in 2013. Especially, Lake Kawaguchi is the most popular place to view Mt.Fuji. We will visit three view spots and enjoy cruising at Lake Kawaguchi. - Arakurayama Sengen Park : You can take a picture of Mt. Fuji with five-story pagoda. - Mt. Kachikachi Ropeway. At the height of 1,075 meters, you can see a panoramic view of Mount Fuji and Lake Kawaguchi. - Cruising at Lake Kawaguchi. 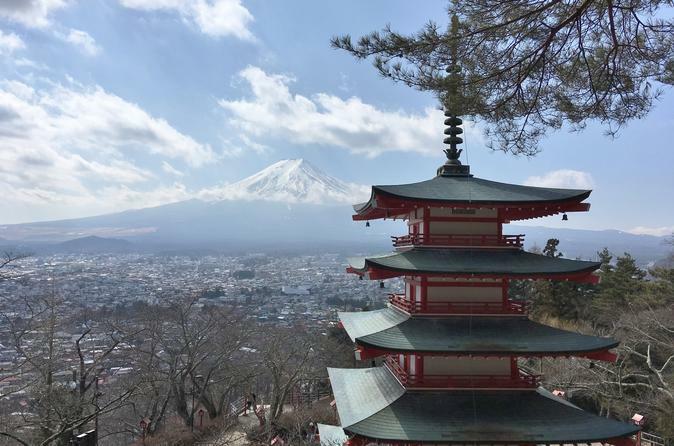 - Oshino Hakkai : You can take a picture of Mt.Fuji with traditional Japanese houses. 8:00 Meet at your Hotel and move to Shinjuku by Subway. 8:55 Highway bus from Shinjuku to Shinyoshida about 90 minutes. Climb up to Arakurayama Sengen Park. You can take a picture of Mt. Fuji with five-story pagoda. Please be noted that we have to climb up 398 stairs. 11:52 Train from Shimoyoshida to Lake Kawaguchi about 15 minutes. Mt. Kachikachi Ropeway. At the height of 1,075 meters, you can see a panoramic view of Mount Fuji and Lake Kawaguchi. Cruising at Lake Kawaguchi about 20 minutes. 15:00 Bus from Lake Kawaguchi to Oshino Hakkai about 25 minutes. Strolling Oshino Hakkai. It’s a set of eight ponds with very pure snow melt water. You can take a picture of Mt.Fuji with traditional Japanese houses. 16:40 Highway bus from Oshino Hakkai to Shinjuku. 18:55 Arrive at Shinjuku and move back to your hotel.